For reliable and efficient demolition and earthmoving services at affordable prices, contact pur friendly team at Diamond Earthmovers for a quote. Specialist builders for quality boulder and quarry rock retaining walls for domestic and commercial applications. We supply and install.. Whether you are looking to build, clear or repair a dam we have the equipment available to handle most jobs, large or small..
Diamond Earthmovers have been operating for over 20 years across Victoria. We are a trusted Family owned Melbourne based business that provides the “One stop shop” Service. Diamond Earthmovers boast a comprehensive fleet of earthmoving machinery managed by our experienced owner operators for demolition Melbourne. Our aim is to make your life easier by providing you a one-stop shop for all your Demolition, Excavation and Landscaping needs throughout Victoria. We have built a solid reputation for providing professional advice coupled with an honest and reliable service. Our first priority at Diamond Earthmovers is servicing our clients and exceeding their expectations. With our extensive knowledge of the building, demolition and excavation industries we are able to provide the most efficient and cost effective services for any earthmoving requirements. Our professional staff and extensive industry knowledge provides us the ability to deliver the level of service you deserve and we pride ourselves on our commitment to customer satisfaction. Talk to Us For a Free Quote! The team at Diamond Earthmovers are highly trained and experienced, having completed all relevant certificates to ensure they are able to cater for all your requirements and concerns. All our employees have undergone extensive training as well as developing in-depth experience through years of being heavy machinery operators. We guarantee the service and work delivered by our team is to the highest of standards. We offer Free, No obligation quotes on all our Service’s. Still have questions regarding our services? Contact us today on 0404 497 971 or fill out our “Online Quote Form“ and we will be in contact with you shortly. Demolition Melbourne Services - We've Been Demolishing for Years, We'll Help You Demolish Today! 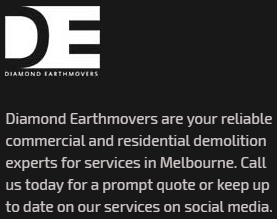 Diamond Earthmovers are the leading home demolition and Earthmoving experts that you can trust. When it comes to ensuring that our clients get the highest-quality service, alongside the best prices, there is no beating us. We can make the difference for your project with our service! We have always believed that our clients deserve the complete package with our service. They should be entitled to what they pay for. And that is why we have always maintained that when our clients come to us to for our commercial and house demolition services, they will get the complete package with us. Part of the Diamond experience is to relax back and let us handle all the drama. We have the experience and knowledge to handle everything that comes our way. That is why we are confident and committed to providing you with the whole package. Part of our specialty is offering the complete package for all house demolition projects. Demolishing a home is no easy task. This is why it is important that all precautions and angles are assessed. With our years of experience, we have the eye for detail to look at each possible problem and provide you with the solution. Once we got all the permits ready to get the project rolling, we sit back, devise our plan and move forward with the process. You can sure that with us in charge, you will get the house demolition that you need for your project or development. Demolishing a house requires an eye for detail, patience, experience and in-depth knowledge to execute. The team here at Diamond Earthmovers can provide you with all of that and get your project demolished. We know what it takes to provide our clients with the best in home demolition. Our structured approach and step-by-step planning will guarantee that you get the service you deserve. If you are looking to get your home demolished, we are the team that can do it for you. When you come to us in regards to getting your property demolished, we will assess the status of your home, the application that you are planning to put in, before coming up with a solid plan to demolish your home. Our demolitions service includes us working with the council to get your application approved, coming up with a solid plan to perform your demolition before removing all the rubbish and debris. Throughout this whole time, our team will be by your side to ensure that you are well-informed and understand our process when it comes to home demolition in Melbourne. Each property is different, so therefore each house demolition has to be approached differently. Once we have the dynamics of your home, the structure of your land and the outline of your design, we will provide you with a plan to get your home demolished. With this information, we will be able to provide you with an accurate timeframe in which your home will be demolished. You shouldn’t have to pay over the top when it comes to residential demolition. We believe that everyone should be entitled to a fair fee when it comes to any residential or building demolition. That is why we are always going to seek to find you the best and most affordable package for your project. We are not just specialists in house demolition projects, we are also experts in commercial and building demolition projects. We have everything you need in a commercial demolition and excavation project. We will look over your building and provide you with the right advice and plan so that you get the finish you want for your project. We have everything you need in a building demolition expert. Not only do we provide commercial and residential demolition services, but as earthmovers, we can help you with a wide selection of additional services. These services can include, rubbish removal, excavation, asbestos removal, concrete works and much more. As the leading earthmovers in Melbourne, you know you can get everything from us. Sometimes it is better to start from scratch. It opens up new opportunities and can give you the boost you want. That is what we can do for you. By hiring a demolition company, like Diamond Earthmover, we can help you with all your demolition needs. From the demolition of your property to the cleanup, from the paperwork to the application, we will provide you with the complete service for your project. Don’t let all the pressure on your shoulders - speak to us today about how we can make the difference for your project. Contact The Diamond Standard Professionals! Do not waste time with other excavation and demolition companies, when you can get the diamond standard right now. We are ready to help you with all your residential demolition, commercial, house demolition, and building demolition projects in Melbourne off the ground. Contact us directly on 0404 497 971 or fill out our “Online Quote Form“. Size of the job; one storey, two storey, size of plot that needs to be demolished. Environment; this can affect the level of dexterity needed and therefore the time commitment. Nature of material to be removed. This can affect the time required for the job. Man power necessary for your project to get the quickest result. Obviously the larger the project the longer it can take. At Diamond Earthmovers we will give you the quickest house demolition service and give you the workforce needed to get the job done asap. To get your quote today, fill in the form on the right. Remember to be as accurate as possible to ensure the correct quote.